Michelle Miller, Second Line umbrella in hand, talks to the crowd outside of the Apollo Theater. Standing behind her is Stefon Harris who performed later at the Apollo Music Cafe. Photos by Yours Truly. NEW Orleans is in the house at the Apollo Theater! And, no doubt, the joint will be jumpin' tonight as it was last night to the sounds of Irvin Mayfield Jr., the New Orleans Jazz Orchestra (NOJO) and friends. Friday night's concert was preceded by the Louis Armstrong Apollo Walk of Fame Induction Ceremony. This bit of jollification jump started the Apollo's New Orleans to Harlem Jazz Weekend. Having her say, too, was Michelle Miller, a Big Easy native, former first lady of that city and current CBS correspondent. Herself greeted the crowd with a spirited Laissez les bons temps rouler! (See video above and below). 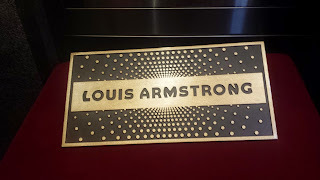 The Armstrong plaque will join those bearing such august names as James Brown, Quincy Jones, Patti LaBelle, Celia Cruz and Chuck Jackson, out on the sidewalk and cutting a debonair figure in dark suit and bright pink scarf. The festivities also marked the reveal of the enshrined plaques of the latter two legends. It is not yet clear where outside the famed front doors of the Apollo that the Satchmo plaque will be laid in to rest. 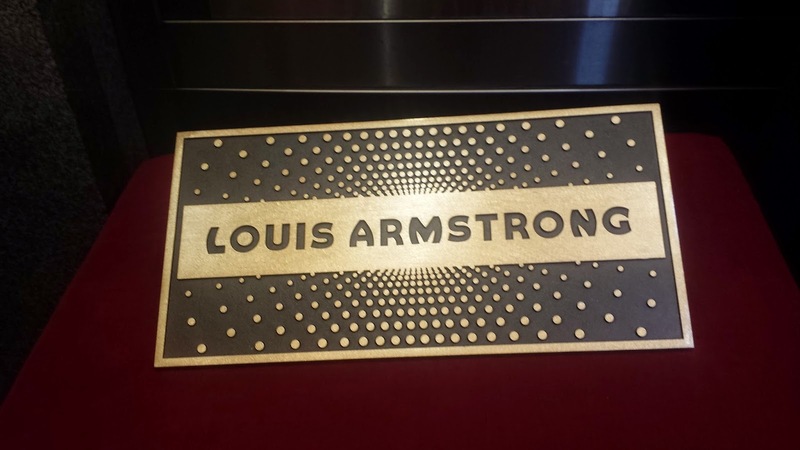 Louis Armstrong is the new kid on the block on the Apollo Walk of Fame. Indeed, the Apollo is on a campaign to inform the world that there is far more to it than its famous and infamous amateur night. The Apollo Music Cafe, the venue of tonight's two remaining shows of the weekend, is also part of that information campaign. On the bill at 8 is IMJr. and NOJO featuring Aaron Neville. The 10 o'clock lineup is Irvin Mayfield's Jazz Playhouse featuring Jon Batiste and select NOJO members. Hard to imagine that the joint won't be jumpin'. Visit http://www.apollotheater.org to learn more about the Apollo Theater, including tonight's concert information and a list of events and programs. Open Call to Fashionistas: Slow Your Roll on Fast Fashion. Shop Here, Not There. Aren't They Lovely; Aren't They Wonderful! VEVLYN'S PEN: The Wright take on life by Vevlyn Wright is licensed under a Creative Commons Attribution-Noncommercial-Share Alike 3.0 United States License . Based on a work at vevlynspen.com . Permissions beyond the scope of this license may be available at vevlyn1@yahoo.com .